Just can't get enough Com Truise? Well, you're in luck; New Jersey artist Seth Haley has also released music under other aliases including Sarin Sunday, Airliner, and Systm. Since the release of his free Cyanide Sisters EP, the name Com Truise has been seeping into indie music blogs and radio stations faster than The Blob. With nods from the likes of Stereogum, URB, and ISO50 (run by one of his favorite artists, Tycho), and a recent DJ gig opening for Neon Indian, his melted city summer beats and nostalgic synth sounds are making waves far beyond fellow Boards of Canada fans. While we wait for the forthcoming Com Truise full-length LP (which I'm going to take a wild guess that it will be coming out on Moodgadget or Ghostly based on their back catalogs and this Tweet, but that is pure speculation! ), and assuming you've already swooped up the 2 free tracks Pyragony/Tripya from his Future Sequence interview and have been following him on Soundcloud, we can explore the other musical releases and web presences of this talented and diligent artist. For whatever reason, his other aliases aren't widely advertised, but are found pretty easily with a small bit of poking around the internet. And yes, they're just as good. Sarin Sunday takes it down a notch, thriving in the realm of nostalgic library music and is one of the closest things to Boards of Canada that I think I've ever heard. Download Sarin Sunday - The Lonely Hike for free from the Archaic Horizon netlabel to hear what I mean. Tracks like "Light Fragments", "Gateway to the Sun" and title number "Lonely Hike" are melodic masterpieces full of warm laboratory sounds, lush, emotional ambiance, and perfect rhythm. There is something about this album that makes me think of watching 3-2-1 Contact or science videos in school, then going outside to play in tall grass near a power plant as the sun sinks in the nuclear sky and slowly disappears. A 4-track EP called "The Path Before Us" is also available on Sarin Sunday's Last.FM but you can download the .zipped .mp3s + front & back artwork directly HERE. 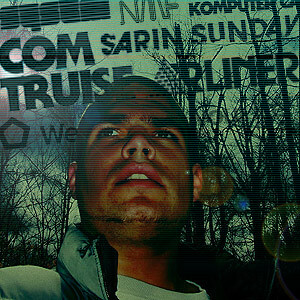 As far as style and mood go, Airliner sits somewhere between Com Truise and Sarin Sunday. Here he combines those warped '80s science VHS sounds and lush synths with atmospheric samples and deep chilled beats with hip hop influence. You can currently buy the Airliner - None LP via Bandcamp for $6 USD. Another release called "Self Destruct Pt. 1" is also advertised on the Airliner MySpace page, but the Bandcamp account it links to is no longer active. UPDATE: Oct. 15th, 2010 Com Truise made "Self Destruct Pt. 1" available for download on his site | .zip direct download. Are Com Truise, Sarin Sunday and Airliner putting you to sleep? Systm will kick up your pulse with an injection of buzzy, compressed dance floor electro arcade bangers that fit in perfectly with the MSTRKRFT / Boys Noize / Justice club. Grab the Systm - Invader EP via Bandcamp for $5 USD. Final track "808 Whore" is a hit waiting to happen. A mysterious Flash file on one of his websites hints at an EP called "Splatter Punks" but a download is nowhere to be found. If you are an active member of the Twoism forum, you may remember the upstart of Sarin Sunday's promising blog/label called Nostalgic Music Foundation celebrating the BoC style of ambient music and new artists within the genre. The aesthetics were spot on and the releases were quality, but the project seems to have fizzled. The MySpace page still has songs uploaded to its music player as well as a perpetual call for artists, but the website and digital shop are no longer in operation. Not that he has any spare time right now but I really wish the NMF was flourishing, as I'm sure I'd be a regular customer. Being an art director and digital artist with a sharp eye for current trends in design, I can imagine Seth constantly coming up with new ideas for website layouts and graphics. Welcome To Your Life™ appears to be yet another project for creative outlet. The area with the most content is the "Notes" section which is a blog of thoughts and musical inspirations that hasn't been updated since June 4th, 2010 - right before his Com Truise release. As you can see, Seth Haley is a busy man with a huge passion for what he does. It comes through in his music which I believe is a major factor that keeps us all in anticipation of his next project. I didn't really dig Com Truise when I first heard him but I just discovered Airliner the other day and loved it! Just DL'd self destruct EP and it is brilliant! Floaty synth sounds like Tycho but with a heavy-footed beat kinda like Giraffage. It all blends nicely in my ear cans. I feel like I've found a gold mine, I'll be digging through these all week, thanks for the links! You can find all his Komputer Casts up on his site now, kc1 - kc6 at time of writing.